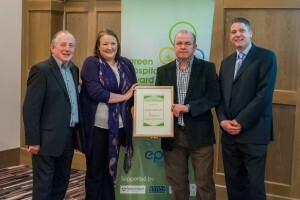 Ireland’s top ten Green Hotels, as verified by The Green Hospitality Programme, were announced at the ‘Responsible Tourism Conference’ which took place in the Radisson Blu Hotel, Golden Lane in Dublin. 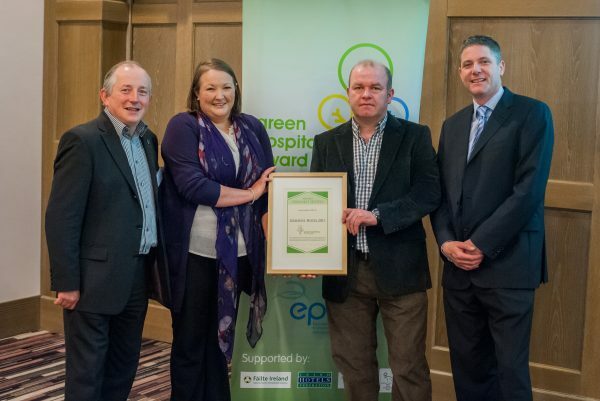 Based on 2013 environmental benchmark figures produced by hotels, The Green Hospitality Programme has produced its first league table listing for the Greenest Hotels In Ireland, based on what Irish hotels are doing to reduce their environmental footprint. Benchmarks for waste, energy water and carbon footprint were considered. In 7th place was Killeshin Hotel, Portlaoise, Co Laois. This hotel is a committed Green Hospitality Member since 2010 and rated highly in both the waste management category and the Energy efficiency category. Coming out on top was The Westport Woods Hotel, Westport, Co. Mayo, which was one of the first hotels to join the Programme in 2004. The hotel has been actively involved in reducing its environmental footprint ever since and has exceeded its goals. For more information, visit www.ghaward.ie. Green Hospitality is one of the flagship programmes of the National Waste Prevention Programme. It is the only Irish developed environmental certification standard for the hospitality sector. Member hotels and other businesses in the hospitality industry set themselves targets to reduce their environmental footprint, and in so doing, save themselves thousands of Euros per year. By adhering to The Green Hospitality Programme advice, members aim to reduce carbon emissions by reducing energy consumption, preserve scarce water resources and minimize waste production.